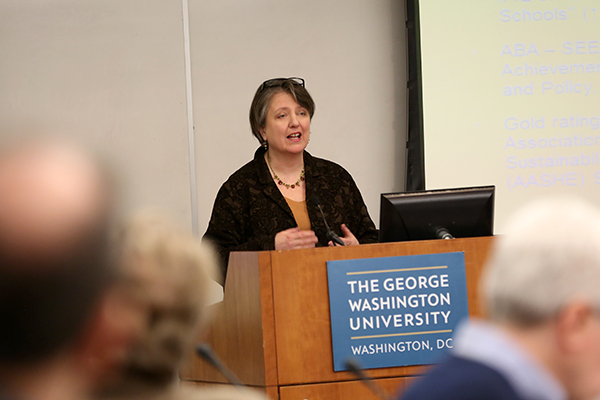 Kathleen Merrigan, GW’s executive director of sustainability, discusses her plans to boost sustainability research during the Feb. 13 Faculty Senate meeting. GW’s graduate degree options are about to get a little greener. Officials are beginning to plan out a master’s degree in sustainable governance to boost GW’s portfolio of sustainability-related graduate programs, Executive Director of Sustainability Kathleen Merrigan said. Experts say the degree could help students launch careers in a field that is continuing to grow. “We see an opportunity to be a lead educator in sustainability governance, different from policy, different from management,” Merrigan said at this month’s Faculty Senate meeting. Merrigan declined to provide details about the degree or a timeline for when the program would start taking applications. “We are exploring various sustainability course offerings and degree programs, but it is too early to comment further,” she said in an email. The degree would help more students jump into a growing field: Between 1995 and 2008, the number of companies with chief sustainability officers quadrupled, according to a Harvard Business School study. The University has looked to add more programs in the subject area since launching a sustainability minor in fall 2012, Sustainability Program Director Lisa Benton-Short said. “Our sustainability undergraduate minor is just the first step in what we hope will be a range of undergraduate and graduate degree and certificate programs that will mark GW as a leader in sustainability policy and governance at the national and global level,” Benton-Short said. As the University increases its offerings in sustainability, Benton-Short said GW will put itself in a better position to be awarded federal grants for sustainability research projects. “As we establish new academic programs in sustainability, reaching out to the federal government makes a lot of sense,” she said. Lee Paddock, the associate dean for environmental law studies at the GW Law School, said he has not heard of many schools that offer a degree in sustainable governance. He said adding a master’s in sustainable governance could make GW a leader in sustainability programs nationwide. “There’s an opportunity here to assume a leadership position if we could focus on how you might build the student knowledge and also build the public policy idea base focusing on the idea of governing for sustainability,” Paddock said. Ashwani Vasishth, who manages the sustainability master’s degree at Ramapo College, said a degree in sustainable governance fills a gap in sustainability education. Federal and state policymaking in the U.S. are “very siloed by discipline,” he said, but sustainability’s interdisciplinary nature can unify decision makers. “There’s a really crying need for graduates who are trained in a holistic approach to sustainability in the policy world,” he said. Katerina Kinast, the graduate adviser of Arizona State University’s School of Sustainability, said since sustainability is becoming a higher education buzzword, schools and students must make sure employers understand which classes go into each degree.